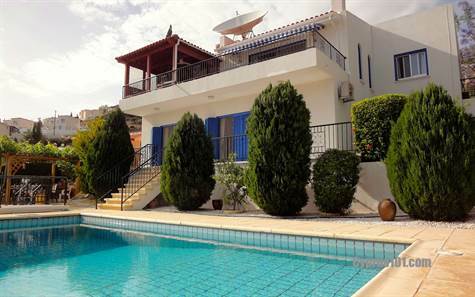 Peyia, Paphos - This superb luxury villa is situated on a large elevated plot a few minutes from the village of Peyia. The property has been designed to take advantage of the superb panoramic views which can be enjoyed from many aspects of the property. A pathway leads through beautifully landscaped gardens to the front entrance of the property. The entrance hallway features fitted shelving and useful storage cupboards. To the right is the living accommodation and to the left, a double size bedroom with fitted wardrobes/sea views and separate shower room. The living accommodation is very spacious and nicely designed with attractive arches. The lounge features arched windows, a stone surround fireplace with log burner fire and patio doors opening on to a large balcony with fitted pergola and fantastic panoramic sea and mountain views. The stylish modern kitchen includes granite worktops, breakfast bar, cooker, stainless steel cooker hood, integrated fridge/freezer dishwasher and microwave. Adjacent to this is the dining area which also has direct access to the amazing balcony, pergola and outdoor seating area. The views from here, together with the amazing sunsets, are absolutely breath-taking. A central granite staircase leads down to a hallway with fitted storage cupboard, master bedroom with en-suite bathroom, two further double bedrooms and a family size bathroom. All three bedrooms have fitted wardrobes and sea views with patio windows opening on to an upper balcony overlooking the pool terrace and landscaped gardens. In addition there is a large utility room/store room which can easily be used as a 5th bedroom, study/sitting room or second kitchen. The views from the pool terrace are also stunning and there is a second pergola and seating/barbacue area on the one side. The property is currently a permanent home and maintained to a very high standard. It has a range of quality finishes and many practical conveniences such as a workshop and shed for storage. The gardens feature a lower terraced garden and a variety of colorful plants and trees. A perfect family residence or holiday home with full title deeds. Please refer to MLS#: 1322 when inquiring.